In 1921, Quirt left Iron River to attend the Layton School of Art in Milwaukee. His progress there led to part-time work as a drawing instructor, and by 1926, Quirt was teaching novice classes and outdoor sketching. While at the School, Quirt produced his earliest watercolors, and his paintings were exhibited at the Art Institute of Chicago in 1926 and in the International Watercolor exhibitions of 1929. During this time, Quirt also studied at the McDowell Colony in New Hampshire but his formal training went no further, allowing him the independence to experiment stylistically throughout a very prolific and eclectic career. Quirt left Milwaukee for New York City in 1929, a change he had long looked forward to. His arrival in the city coincided with the onset of the Great Depression, and soon he was involved in the radical causes that would influence his work throughout the 1930s. Within a year such leading leftwing periodicals as New Masses, New Pioneer and Art Front were publishing his socially and politically engaged drawings. Quirt's future paintings would evolve from these illustrations. In 1931, Quirt married Martha Pearse of Milwaukee. The following year, Quirt became secretary of the art section of the John Reed Club, an organization associated with the Communist Party USA and committed to encouraging young, leftist talent. Appealing to the art section’s affiliates across the country, Quirt created newsletters calling for an increase in politically- and socially-themed artwork. In February 1933, along with one-hundred other artists, he contributed to the John Reed Club's first art exhibition titled The Social Viewpoint in Art. Though Quirt had work creating sketches and murals, he needed a stable income to survive the Great Depression. In October 1935, Quirt landed a position with the New York City branch of the Works Progress Administration/Federal Art Project, which kept him employed for the next seven years. During this time, Quirt painted small panels that echoed influences ranging from Diego Rivera and Jose Orozco to Salvador Dali and de Chirico. In February 1936, New York's exclusive Julien Levy Gallery held Quirt's first solo-exhibition with sixteen works reflecting the cultural and economic tone of both the American Artists' Congress and the current New York art scene. In defending the decision to exhibit an obscure social-surrealist, a spokesperson affirmed that the work of the gallery's “first radical painter” was not only fresh and innovative but also of profound social and political importance (Swanson 19). The success of this show paved the way for Quirt's future artistic endeavors. In January 1937, Quirt participated in a panel with Dali at the Museum of Modern Art on “Surrealism and Its Political Significance.” Here Quirt voiced his candid Marxist views, arguing that Dali's doctrines on Surrealism paralleled those of Fascism and that human emotions could be divided into a dichotomy of fascist or revolutionary ideologies. (Swanson 19). Although critics took offense, Quirt stood true to his radical beliefs. By the late 1930s, however, the Freudian analysis that he had begun in 1935 led to dramatic changes in Quirt's opinions and art. While painting murals for Bellevue Hospital in 1937 and 1938, Quirt, now divorced, met and fell in love with Eleanor Falk, an assistant to the mural project. In 1939, they married. With his outlook changing, Quirt sought out the Pinacotheca Gallery, and in 1941, began painting and writing newsletters for the gallery. His comments in these newsletters on 1930s art suggested the reasons for his departure from Marxism. In “Social Content vs. Art,” for example, he questioned whether a direct social-surrealist portrayal of society and politics in painting could count as art, or if a more indirect approach using “art's language” would be more effective (Swanson 21). His time under Freudian analysis along with his disillusionment with the Communist Party after the Soviet-Nazi pact of 1939 both contributed to his changed political and artistic stance. With his wife and newborn son Andrew, Quirt left New York City for Milwaukee in mid-1944 to resume work as a teacher at the Layton School of Art, a move which Mrs. Quirt describes as a “screaming disaster.” It was in Milwaukee that Quirt’s ten-year long drinking problem began, getting so bad some nights that he would make threats to Mrs. Quirt of jumping off their apartment’s fire escape at night. According to Mrs. Quirt, “Walter was fun, prankish, a delight the first five years, but when he hit alcohol he was a mess.” The following year Quirt moved his family to East Lansing, Michigan for another teaching position at Michigan State University, where he taught until 1947. A second son, Peter, was born in 1948, and the youngest, Jonathan, in 1952. Although the two teaching positions allowed Quirt to provide for his growing family with his first steady salary since leaving the WPA/FAP in 1942, the increased workload and his growing drinking habit led to a sense of isolation during his time in Wisconsin and Michigan (Eleanor Quirt). Despite his unhappiness in the Midwest, Quirt continued painting and writing productively. He had exhibitions at the Duveem-Graham Gallery in 1957, the Greer Gallery in 1963. With a grant from the Ford Foundation, the American Federation of Arts sponsored the “Walter Quirt Retrospective,” in which forty-two of his pieces traveled throughout the United States between 1960 and 1962. In 1967 the University of Michigan presented him with a grant to spend a quarter in an isolated area of the Yucatan to develop his ideas on composition and design by studying the “linear preferences” of the local population (Swanson 25). Mrs. Quirt says that while Walter was there, he resided in “some shack that a woman had died in. It was moist, so the acrylic paint wouldn’t dry and he came home with intestinal parasites and lung problems.” In 1967, Quirt fell ill with lung cancer; ‘he was a smoker and that’s what did him in” says Mrs. Quirt. He died on March 19, 1968 in Minneapolis, Minnesota. Throughout his life Quirt's passion for new ideas only increased with time and he was working diligently to expand his oeuvre even at the end of his life. Mrs. Quirt affectionately describes her late husband as an “Irish imp”--full of life, confrontational and passionate, constantly “explor[ing] various modes of communication through visual means.” Quirt’s unpredictable personality coincided with his ever-changing artistic style. Throughout his life as an artist, Quirt dared to rely on his impulses and his courage in order to create the most effective art. The cost of such independence may have been that he had to suffer, but as Quirt's constantly evolving theories regarding art, society and nature changed with every decade, so did his style and technique. By the end of his career he had fulfilled his lifelong objective of communicating with an extensive audience. Quirt began his painting career as a Social Realist but eventually converted to Social Surrealist techniques in order to express his passion for political struggle and social awareness in his art. While he based his paintings on life in the tangible world of human interaction, his complex surrealist visuals allowed him to intensify the authority of his many social-political testimonials. Until the late 1930s, Quirt used his art as a propagandistic instrument, denouncing such issues as the exploitation of workers, unemployment, poverty and inequities toward Black Americans. He did so by pairing contradictory images with intricate arrangements of overlapping and entwined metaphorical assemblages that were, according to art critic Ilene Susan Fort, “psychologically associated but formally disconnected” (11). Quirt often devised compositions in which barrier-like formations contained the figures and divided the spatial arrangements. This was a mechanism that he felt was essential to his subject matter as it allowed him to coalesce dissimilar times and places into a single work of art, as he does, for example, in Conflict(1935). Critics frequently compared Quirt's initial Surrealist paintings to works by Dali, since the compositions of both artists were similarly radiant, fluid and smooth (Lansing 31). Unlike Dali, Quirt focused upon the predicaments of farmers, workers and African-Americans, filling his earliest paintings with powerful and complex surreal compositions that illustrated his beliefs that capitalism was a source of universal human suffering. By the late 1930s, after leaving the Communist Party and undergoing Freudian psychoanalysis, Quirt transformed his style from Social Surrealism to a more abstract Surrealism. He began to focus more upon finding a better society through personal motivations rather than trying to mend unfortunate social conditions by political means. Such paintings from this period of his career as I'm Going Away, Far Far into the Distance, Never to Return, Goodbye (1942) are permeated with mythical Freudian dream imagery and primordial symbolism, and the undulating ribbons of paint and color evoke incessant, seemingly eternal movement. His use of color and form in these paintings now allowed the once-political artist to express himself psychologically and emotionally (Fort 17). Quirt continued expanding his ideas about the human condition into the 1940s. His paintings from this era reveal his anger on a more international or even universal level about the catastrophes triggered by WWII. Quirt continued using luminous ribbons of paint which twist into more discreetly colored labyrinths of winding forms. These paintings are filled not only with anger but also bitterness and anguish. In the late 1940s Quirt's style changed yet again when he moved from curvilinear works to more geometric abstract compositions. In Origin of Life(1946), for example, Native American hunters and their dogs are portrayed in geometrical shapes and forms. Quirt turns the violence of the hunt into an amusing display of playfulness (Swanson 24). With geometric abstractions, though, Quirt sensed that he was dehumanizing his forms, so again he adjusted the shapes to appear more like semi-defined geometric figures. In the late 1940s and into the mid-1950s Quirt freed his painting of the ribbons-of-color geometric forms. He concentrated rather upon pure motion, with swiftly painted depictions of figures and the simple objectiveness of the white space. Quirt stated that “[he] was interested in the space outside the object” (Coates 9). In paintings from 1959 to 1963, Quirt implemented two new images which stemmed respectively from his impulsive and introspective sides: running horses and the reserved, DeKooning-esque, monumental figure. Eleanor Quirt recalls that Quirt had Indian ponies as a child, and the horse image became an agent for Quirt’s brushwork. 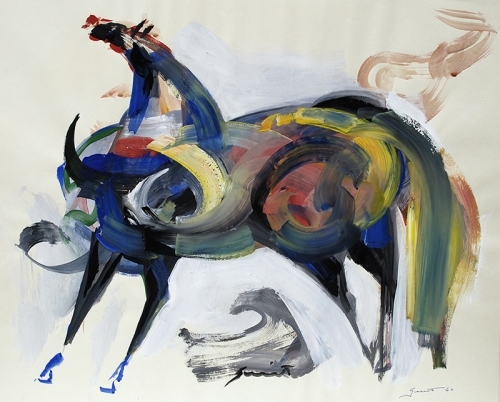 She describes her husband’s boldly confident lines in Running Horses (1959) as ‘joyous.’ Quirt painted his monumental figures with a more controlled calligraphic line, and he encased them within colored sections of tans and grays. In canvases from the late 1950s through the mid-1960s, Quirt continued utilizing the counter-curve in his paintings because he believed that it was “the more civilized linear element” and that the motion of the S-shaped line transforms objects in art into positive, non-aggressive energy and love (Swanson, 25). In his last group of paintings, the Lake Harriet Series, Quirt endeavored to portray an ‘entire society at play” (Swanson 25). Eleanor Quirt describes this point in her husband’s life as a ‘benign period.’ Since they lived close to Lake Harriet, Quirt took strolls down to the lake to sketch people riding bicycles, throwing Frisbees and swimming. The series was “Cezanne-like, hippy-ish, garish and full of energy” (Quirt). This last series of Quirt’s career can be viewed as a unification of all the works he created throughout his life. His wide-ranging oeuvre cannot be narrowed down to one category, as his style continuously evolved throughout his career, but according to Eleanor Quirt “everything he ever did had a lyrical line. Period.” His style shifted through stages of Realism, Surrealism, fantasy and abstraction, but he always managed to articulate his social and personal beliefs. His unpredictable personality and his passion for new ideas and techniques drove him to experiment endlessly and in doing so he created works of art that at best were both meaningful and profound. In the words of New York Times critic Robert M. Coates, Quirt “is one of the most impassioned artists alive today and […] has achieved something close to true monumentality” (Swanson 25). 1935 Joins rolls of WPA/FAP with position of Artist; also starts psychoanalysis under Dr. Margaret Fries continuing through 1938. 1. Coates, Robert M. Walter Quirt. New York: The American Federation of Arts, 1960. 2. Fort, Ilene Susan. Archives of American Art Journal Vol. 22, #3: American Social Surrealism. Washington D.C, 1982. 3. Lansing, Garrit L. “Surrealism as a Weapon” from Surrealism U.S.A. by Isabelle Dervaux. New York: National Academy Museum, 2004. 4. Swanson, Mary Towley. Walter Quirt: A Retrospective. Minneapolis: University Art Gallery, 1980. 5. Author’s telephone interview with Eleanor Quirt. September 23, 2007.